The sun beats down, the soil is dry and dusty. A pitch-black, cleverly camouflaged Gran Turismo battles over the stony ground. Again and again the deep potholes shake the vehicle and its occupants. A tour de force for the new Porsche Panamera. That’s how it has to be. Testing means going to extremes. Only then can the technology reach ultimate perfection. This is exactly what took a team of engineers from the Porsche Development Centre in Weissach to South Africa. With a convoy of test vehicles from Cape Town, past Franschoek at the foot of the Drakenstein Mountains, to Hermanus in the Western Cape to the Little Karoo, one of the most popular travel routes in the area. Desert landscape to mountains. Gravel to asphalt. Extreme aridity to moist subtropical climate. 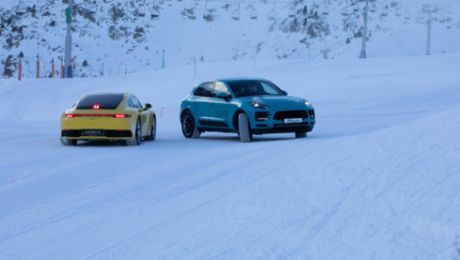 For two weeks, the developers will confront the new Panamera with these extremes at the Cape of Good Hope. Engines, transmission, chassis, operating concept in the interior – everything is new in this second generation of the four-door Porsche. And here it will be tested and tuned under exceptional conditions. Back in Weissach, the new Panamera will receive its finishing touches based on these findings. Soon customers will be driving it along the roads of the world – probably in not quite as harsh surroundings as here in South Africa.